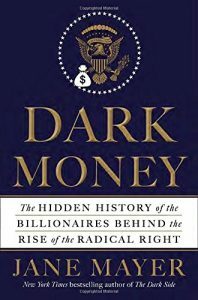 Jane Mayer has followed the money trail from a small, quiet group of far right wing billionaires to recipients aligned with their political ambitions. Led most famously by the libertarian Koch brothers, this cabal has donated hundreds of millions over the last two decades to academics, think tanks, media outlets, and politicians. Their goal has been eliminating regulations, preserving tax loopholes for the wealthy, gerrymandering political districts to negate votes of liberals, discarding government health and education programs for low-income Americans, and forestalling any action on climate change. With the exception of Obama’s terms in office, nearly every one of their objectives has been achieved. The Supreme Court, Congress, Governerships, State Houses, and Presidency are all dominated by the political rightwing. Because Republicans at every level of government toe the line drawn by the Kochs and similar donors, Mayer suggests that realistically the United States has become an oligarchy ruled by wealthy magnates rather than by democratic process. While she can be criticized for overlooking similar tactics undertaken by liberals or missed opportunities when the left could have used similar techniques, the overall case stands. Huge sums of money strategically disbursed by extreme conservatives has radically altered America’s government and its policies.